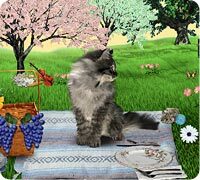 Cyska Siberians is a new virtual pet site featuring 3D animated, interactive, realistic Siberian Forest Cats. We're cat people here and we strive to create virtual feline companions that you can relate to. What really sets us apart from other pet games, though, is that our cats' personalities are based on their stats and they actually display different behaviors accordingly. Registration and your first cat adoption is free, but we offer paid-for game currency if you like what you see and want to enhance your experience. As an alternative, by simply logging in and playing the game, you can earn free currency to buy cat food and decorative items and experience points to level up in the game. We have a friendly and caring community of teens and adults who love meeting new members, so don't be shy. Join today and grow with us! We have many new and exciting features to introduce as we develop the site.